Fakhar Zaman was dismissed by Bhuvneshwar Kumar after facing nine deliveries. 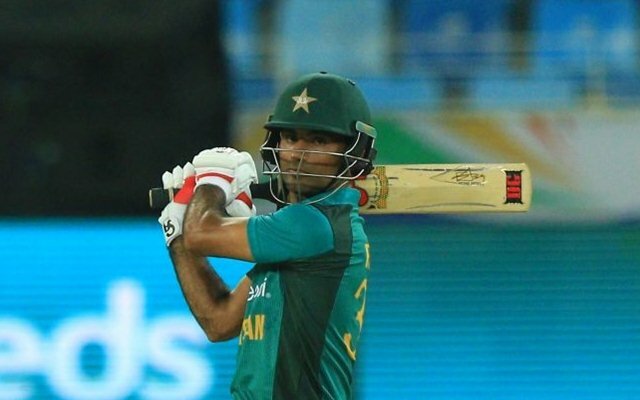 Fakhar Zaman’s presence was highlighted ahead of the India-Pakistan match in the Asia Cup 2018 due to his exploits when the two teams faced off last time. During the Champions Trophy final in 2017, Fakhar scored a quick-fire century that virtually put India out of the game. Given Fakhar and Imam-ul-Haq’s recent partnerships, everyone expected them to tackle the Indian pace duo of Bhuvneshwar Kumar and Jasprit Bumrah. However, the two left-handers were back in the pavilion by 5th over of their innings having elected to bat first. Imam was caught behind on the first ball of the 3rd over from Bhuvneshwar scoring only two runs. On the first ball of the very next over, Bhuvi bounced out Fakhar who bagged his first duck in the ODI format. The fastest man to 1000 ODI runs played out a maiden against Bumrah, who got better of Fakhar in that CT final but was denied the wicket having overstepped. 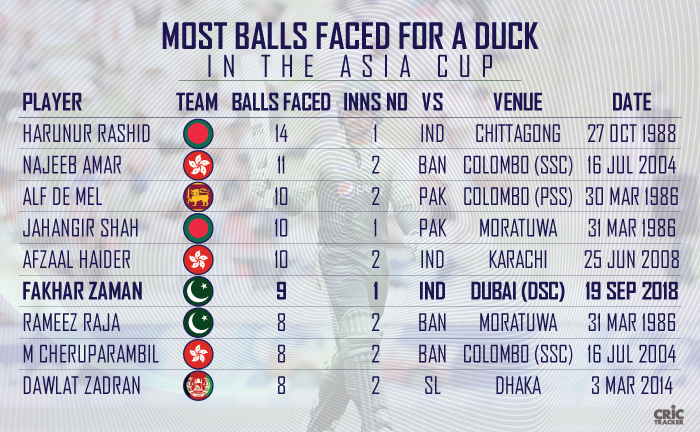 Fakhar was dismissed after facing nine deliveries thus registering the most balls faced by a Pakistan player to bag a duck in the Asia Cup. The previous record was held by Rameez Raja who got out without scoring on the 8th ball he faced against Bangladesh in 1986. Fakhar’s duck is also the longest in the Asia Cup since 10-ball duck by Afzaal Haider of Hong Kong also against India in the 2008 edition. The overall record is held by Bangladesh’s Harunur Rashid who was dismissed on the 14th ball he faced against India in 1988. 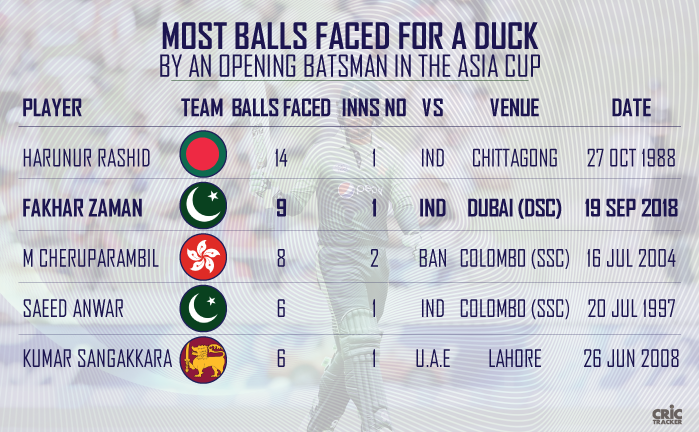 It is also the record for most balls an opener faced before bagging a duck in the Asia Cup. Fakhar’s 9-ball duck is the 2nd most behind Harunur’s 14-ball duck among the openers in this tournament. At this same venue last year, Ahmed Shehzad bagged a 12-ball duck opening the innings against Sri Lanka which is the longest batted duck by a Pakistan opener in the ODI format.